Parallel bars system PLUS Line for for adults. Height adjustable bars cm 74 ÷ 102. The STandGOSystem allows precise adjustment of the handrails by means of a foot control. Parallel bars system PLUS Line for children. Height adjustable bars cm 64 ÷ 80. The STandGOSystem allows precise adjustment of the handrails by means of a foot control. Parallel bar system, height adjustable by means of a telescopic system. Locking is assured by an exclusive double-action hand wheel. Modular walking paths used within a specific therapeutic rehabilitation and ambulation program. Consist of several modules of different materials, combined to create homogeneous or differentiated paths. Modular staircases and ramps Plus Line, for rehabilitation and physical therapy. Height adjustable handrails with STandGO system which allows precise adjustment by using a simple, single control. Standard line modular stairs for rehabilitation provided with fixed height handtrails. Modular staircases and adjustable parallel bars for use in physical therapy. 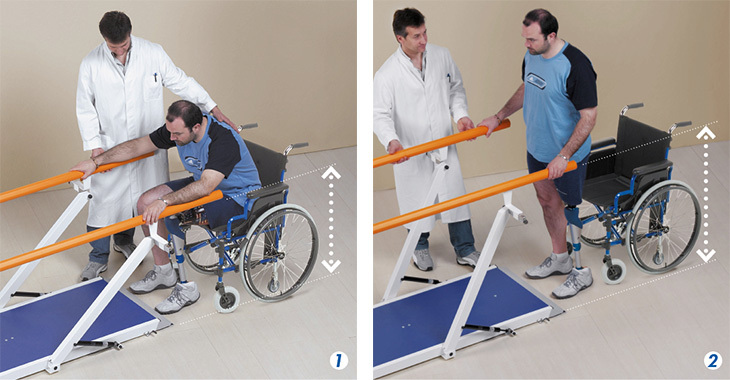 Modular parallel bar systems and parallel bars allow performing exercises within a therapeutic rehabilitation program. The modular parallel bars Plus Line are characterized by the innovative STandGOSystem™ for simultaneous and precise adjustment of the handrails on the two sides, which keeps them perfectly parallel by means of a single control that requires minimum effort to be operated. The foot control activates gas springs for continuous movement, thus ensuring maximum precision and uniform adjustment, which can be millimetric or, in any event, extremely precise and can be quickly carried out even during rehabilitation exercise. The handrails can also be adjusted in width. Handrail width adjustment. When making height adjustments, also check the translation of the parallel bars. The dynamic of this function allow the user to comfortably place his/her forearms on the handrails while remaining seated, without having to be transferred onto the main footboard (photo 1) by wheelchair. In this manner, the patient can apply he levers and effort available for his/her natural verticalization while supported by the "STandGO System"™, and reduce the necessary for assistance from the therapist (photo 2). 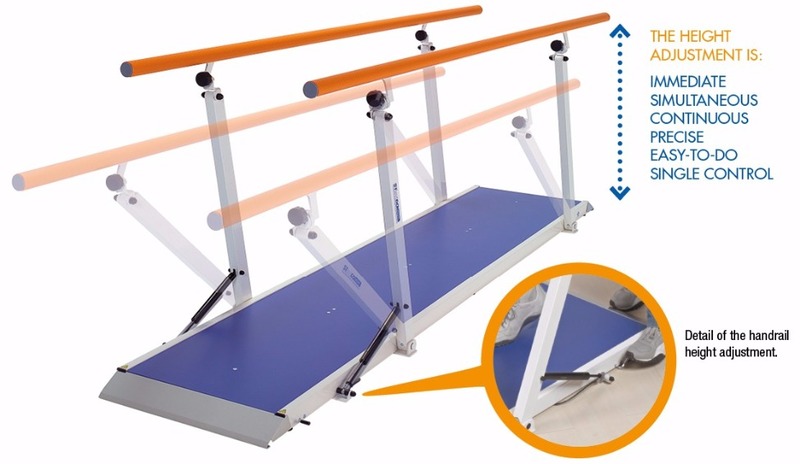 The parallel bars in the Plus Line allow carrying out step training by optimizing patient locomotion as a result of the simple and immediate adjustment system for height and width, with adaptation to the motor pattern that will be developed. 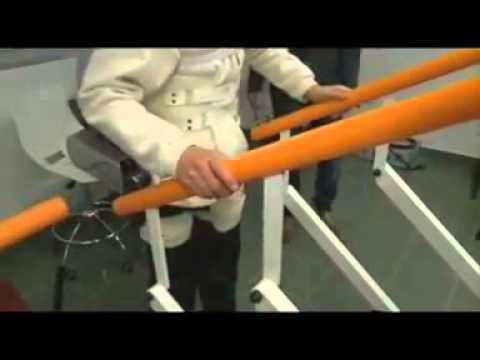 During the initial phase, maximum support is ensured to the upper limbs (photo 1); then the handrail height is progresssively reduced until the user's hands just brush them (photo 2) or don't touch them at all. In this manner, the parallel bars will not be an obstacle for correct posture by the user when ambulation during functional recovery. The modularity of the parallel bar systems in the Plus Line allows the patient to be involved and motivated when ambulating, leaving the therapist more time to dedicate to observing and evaluating functional improvements during the exercise. Therefore, the therapist can concentrate - especially in the case of subjects with extremely compromised neuro-motor characteristics - on continuously correcting gestures, rate, angles and the kinematic mechanism while the patient ambulates, until the most correct motor pattern is obtained. This image illustrates an example of modularity by combining two 3-meter long and one 2-meter long parallel bars, thus obtaining an 8-meter long walkpath. Detail of the limit switch element for the parallel bar glider. The parallel modules can be joined without any fixings being required. Simply remove the access ramp. A parallel course of the required length can be created. 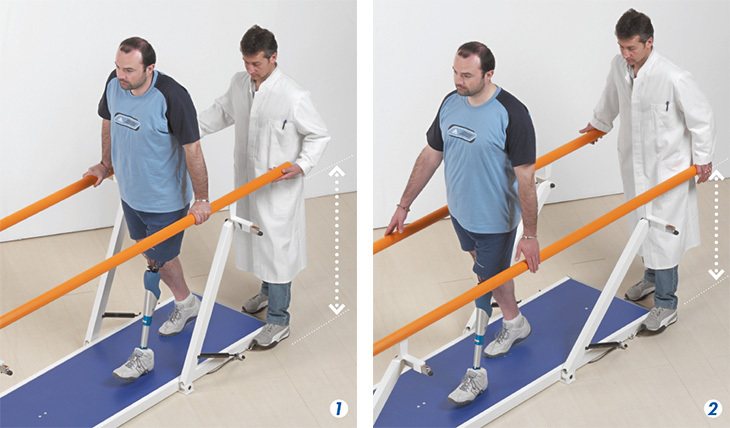 Limit bar to assist the user with changing the walking direction, and extending the therapeutic – rehabilitation course. International Edition, printed in October 2016; Pages 291 - 308; English.